A new image was recently revealed for Pokemon Sun and Moon. The image centers on the game's battle mechanics and the new features that Game Freak and the Pokemon Company have implemented into the new 3DS titles. 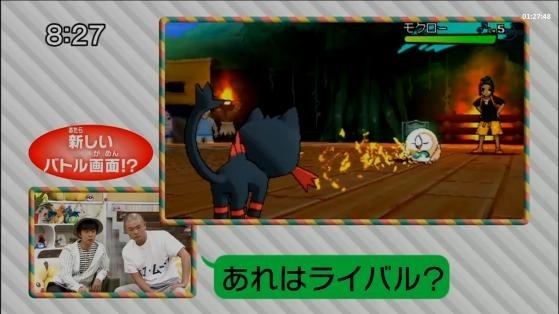 As you can see in the image above, captured from the Japanese television show Pokenchi by ComicBook.com, there are a few distinct changes to way that battles play out in the turn-based RPG. One of the most obvious changes from previous Pokemon games is the fact that the background is an actual battle stage instead of a generic backdrop with the trainers pictured in a corner and the Pokemon on a battlefield. Instead, we see that they are situated on a wooden platform outdoors with fire in ground fixtures surrounding the platform. ComicBook.com also points out that new to Pokemon Sun and Pokemon Moon is the addition of spectators. They point to the background of the image that shows various NPCs standing around watching as the Pokemon do battle. The article likens this immersive inclusion to the way fights usually played out in the television show, where it wasn't uncommon to see various people walking around and stopping to see a Pokemon battle take place. That will likely make the fights in Pokemon Sun and Moon feel a lot more important and given that most players probably won't want to lose in front of an audience... even if it's a fictional one. The platform where the battle takes place appears to be tournament oriented, though. So we don't know for sure if every battle will have a specialized location or if only certain backgrounds will have special stages. It's likely that more generic fights taking place out in the wild will have generic backgrounds, but we won't know for sure until Nintendo reveals more. It's a real shame because E3 would have been the perfect opportunity to further explore the features and new content in Pokemon Sun and Moon but Nintendo has opted to only focus on The Legend of Zelda at the upcoming event. Nevertheless, there's one other feature that was pointed out by Comicbook.com that's new to this entry in the long-running turn-based battle RPG: trainers are now on the battlefield. In the background you can see that the trainer for Rowlet is standing just behind the Pokemon, reacting to what's happening during the battle. It's a brand new step in a more immersive direction for the Pokemon games. So far we've only had tidbits of information released for the upcoming titles leading toward the November 18th launch date. There's still a lot more to discover about Pokemon Sun and Moon, especially in regards to the new transportation system that they haven't discussed yet. But if the image above is any indication, we'll likely receive some more small morsels of info over the next several months as the release for the game approaches.